Everything you need to accurately and sensitively measure exosomal RNAs from media, urine, and other biofluids (except serum, plasma, and ascites fluid). Looking for biomarkers? SBI’s SeraMir Exosome RNA Amplification Kit for Media & Urine can help. Providing everything you need to accurately and sensitively measure exosomal RNAs (exoRNAs) from most biofluids, our SeraMir Exosome RNA Amplification Kit for Media & Urine can take you from sample to amplified exoRNAs in a single day (for exoRNA isolation from serum, plasma, or ascites fluid, use the SeraMir Exosome RNA Amplification Kit for Media and Urine). With cargo that reflects the makeup of their parent cells and their easy isolation, researchers are increasingly turning to exosomes as a source of disease-related biomarkers. To simplify and standardize the isolation of RNA from exosomes, SBI has developed the SeraMir family of products. 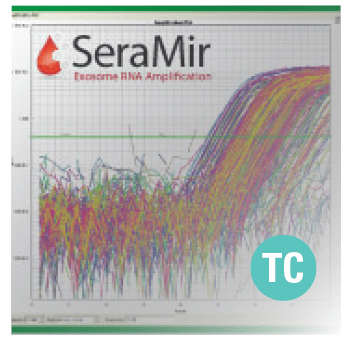 The SeraMir Exosome RNA Amplification Kit for Media & Urine includes everything you need to accurately and sensitively measure RNAs from most biofluids—ExoQuick-TC for fast and efficient exosome isolation, a phenol-free lysis buffer and rapid spin columns for exoRNA isolation, and reagents for 3’ tailing and simultaneous tagging of both 5’ and 3’ ends during cDNA synthesis so you can go straight to qPCR. In addition, primers for PCR amplification are included to make double-stranded cDNA via T7 IVT. These amplified exoRNAs can be used to construct microarrays or for next generation sequencing applications. The amplified exoRNAs are ready for use in microarrays or NGS. Because RNA ligase is not used, you can avoid complicating adaptor concatemer artifacts. Use the SeraMir spike-in RNA control in a qPCR assay to control for exoRNA recovery, tailing, and cDNA synthesis. Figure 1. Serum RNA prepared by the SeraMir Kit delivers more reliable, reproducible qPCR profiles than when the RNA is isolated using conventional Trizol methods. Profiling of 380 Human microRNAs across the SeraMir 384 Profiler. The phenol-free exosome lysis step coupled to the small RNA binding columns isolates exoRNAs with much higher purity than Trizol/Phenol based methods. The SeraMir exoRNAs are compatible with downstream polyadenylation and reverse trancription reactions for amplification and accurate qPCR profiling. Figure 2. Serum exoRNAs prepared using SeraMir deliver excellent performance in microarray studies. Samples from a pooled normal serum preparation and from a male caucasian (age 73) with adenocarcinoma of the colon were used in this study. Exosomes were precipitated from 250 µL of serum using the SeraMir Exosome RNA Amplification Kit. The T7-amplified “sense” exoRNAs were then used for direct labeling analyses on LC Sciences miRBase ver.16 array chips (performed in triplicate). The exoRNAs were hybridized across 1,214 different microRNAs on the probe set. Of the 1,214 microRNAs analyzed, 79 microRNAs showed a signal intensity >32. Within this set of 79, there was a clear colon versus normal “signature set” of 40 microRNAs that could discriminate normal from colon cancer serum samples with a p-value < 0.01. The identities of the microRNAs found in this study have been masked while further investigation continues.